The sponge bar arrived today, I was quite excited so to speak I have had this 360 for four days without knitting on it lol or maybe it was just me being to impatient. I fitted the new sponge bar straight away and got knitting on it, I tried some tuck stitch and stocking stitch I was going to try slip stitch and fair isle but then I thought let's see if I can get the LC2 lace carriage to work and what do you know it worked straight away I was so pleased, Susan was absolutely correct, she told me that the sponge bar has to be like brand new for the lace carriage to work properly and since I had just fitted a brand new one there was no reason why it shouldn't! I started off with the normal lace (the knit and transfer lace) and that worked great no miss-patterning what's so ever, I then tried fashion lace (the yarn comes out of the carriage) it started dropping stitches but no miss-patterning so I thought hmmm maybe adding more weight will help, I hung a few more claw weights and tried it again, the fashion lace worked perfectly, so that is a tip for lace carriage owners - you need slightly more weight when using the lace carriage than normal stocking stitch. Anyway here is the sample, the wholes in the middle are where the fashion lace went wrong just before I fixed the problem so just try and ignore that. 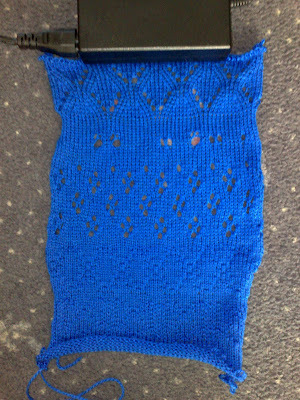 This is a tuck stitch sample I made as well I will be using this tuck pattern and the blue yarn to knit a round neck pullover for my nephew, I am going to use the knit radar so I will knit a tension swatch later and hope fully take the measurements and start on the sweater tomorrow. I don't yet have a ribber so I am going to do a mock rib which I think will look just as nice. Sitting here in a green haze of envy!! It came with the LC2 carriage also??? for that price??? I am soooo jealous. Now I have got that off my chest, can you tell me if you need the LC2 carriage to do the tuck pattern in your second picture? or is that just with the main carriage and the punchcards? Also, if it just with the main carriage and punchcard can you tell me what punchcard number did that pattern please? I still have to try tuck stitch on my machine but this has given me the inspiration to do so. Really am so happy for you that you got your machine and now the sponge bar so you can use it. I'm so pleased that the machine is working perfectly for you and that you got the lace carriage working. I bet you couldn't wait to get that sponge bar in the machine to test it out. 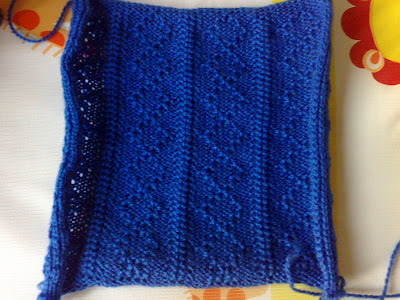 I like that tuck stitch pattern, it looks like one from the basic set - I might have to try that myself. Hi Maureen, I got the Lc2 lace carriage with my knitmaster 700 so I did already have the lc2 prior to getting the 360 but besides the lace carriage I also already had the AG20 intarsia carriage and the RT1 rib transfer carriage, however If the LC2 did come with the 360 it would of been even more of a bargin lol. I am glad I have given you the inspiration to try tuck stitch it is very easy to do you will do it no problem. Thank you as well for the generous comments. Thanks, Alex. I've saved the picture to my desktop. I think that's one I'll be using sometime. Thanks from me too Alex. I printed it up. I know I don't have that one in my set. Some of them were missing when i got my machine. Will punch it up tomorrow. Thanks once again, appreciate the help. That sounds great Maureen I hope you get to try it out i Think it also works for fair isle not sure about slip and weaving you would have to try it. I really love this pattern.